← Time Travel with the Vikings: A List of 15 Books for Kids! These books prove that stories for young middle grade readers can be appealing without being funny. The premise of each book is that Ranger, a golden retriever from modern time, goes back in time to help people who need assistance, and returns to present time when his mission in complete. No people time-travel in this series which is about 98% historical fiction. These stories demonstrate that a certain type of dog (not my yappy, licky dog) can help kids on a perilous journey in various ways. They can find lost people, growl and scare away bad guys, be a pillow for a tired kid, nudge a kid awake who needs to wake up, and bark to distract people. Of course, they can remain a comforting presence through it all. Just look how cute Ranger is! Ranger is a time-traveling golden retriever with search-and-rescue training. In this adventure, he goes to a Maryland plantation during the days of American slavery, where he meets a young girl named Sarah. When she learns that the owner has plans to sell her little brother, Jesse, to a plantation in the Deep South, it means they could be separated forever. Sarah takes their future into her own hands and decides there’s only one way to run — north. I loved the fact that the little brother Jesse in this story was a kid that at times sassed back, misbehaved, and complained. After all, just because his life is in jeopardy doesn’t mean he’s going to behave perfectly. Sarah has to distract him and encourage him as needed to keep him going. The cruel people who populate the book are balanced by kind characters. Sarah and Jesse’s journey consists of several legs. At first, I was surprised that the author didn’t spend more time on the pair’s initial leg right after they fled the plantation. I was left wondering what they ate and exactly where they slept at night. I think when most of us picture people escaping from slavery, we imagine slaves running through woods and swamps, being helped by kind families until they arrive in a free state, where they are then safe. However, this book highlighted how the devastating Fugitive Slave Act of 1850 made it legal for slave catchers to go into free states to capture slaves who had escaped. So even after former slaves arrived in a free state, they often had to keep hiding while there were notices in the newspapers describing the runaways, and keep a low profile for years afterward. I hadn’t thought about this enough, before I read this book. It seems fitting that author Messner spends relatively more time on the children’s journey onnce they arrive in a free state. Next week: Hurry, Freedom (Canadian Flyer Adventures, N0. 7). For more middle grade book reviews follow the MMGM links at Shannon Messenger’s blog. 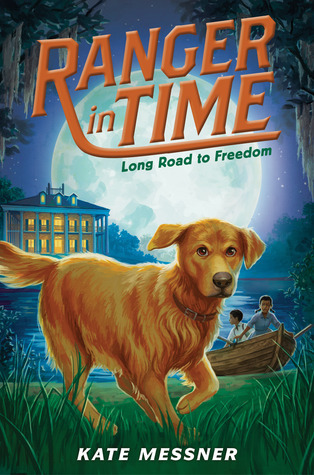 This entry was posted in Book reviews and tagged Kate Messner, kids' time travel stories, Long Road to Freedom, Ranger in Time, time travel books for children, time travel stories, time traveling dog. Bookmark the permalink. I don’t usually like books with animals as the main characters. But this sounds cute. Ha-ha–that’s honest! One impressive thing about these stories is that Ranger is not anthropomorphised, or given any knowledge that a normal dog would not have. He really just thinks like a dog and acts like a dog. I love the premise of this one. I’ve seen the covers before but your review brought them to life. Thanks for the heads-up. Sure. Perhaps some of your students who are not advanced readers would enjoy them.